Expectations are usually a bad thing, especially when travelling. When we are told again and again how beautiful a place is, our expectations are set quite high, and more often than not once we actually lay eyes in the actual place, we feel if not disappointed, at least a bit underwhelmed. ‘It looks like Bellvitge’* Nat remarked as we were riding into Split in the early afternoon after having spent another morning relaxing on the beach. And right she was. Years earlier that had been my exact same impression when we were driving through the outskirts of the city, even though in our case we had zero expectations as nobody had ever told us anything about it. It has to be said then, that when a place is so truly beautiful that it still manages to impress the visitor despite all the hype, it must be something special, and Split is undoubtedly one of those places. The fact that you have to drive through such grey and dull suburbs to get to the center only adds to the surprise. The old town was built on the ruins of the Diocletian palace which itself was a huge complex, and it is a unique and impressive sight. It is still quite touristy, mind you, but not as much as Dubrovnik, there are less cruises calling there and it is mostly local tourism. We enjoyed a long walk in the center and went down to the ferry terminal to enquire about the prices and schedule of the ships going to Brac and Hvar, the two islands in front of the city, which were one of the things I had missed on my previous trip and which I really wanted to see. Prices turned out to be quite reasonable, so we decided to go back the following morning and visit them. 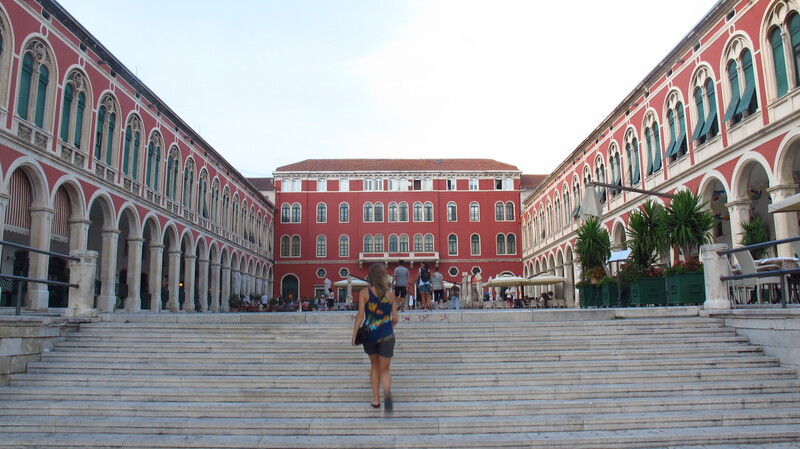 This entry was posted in Stroming The World 2013, Travel and tagged Croatia, Split, STW 2013 by Kilian. Bookmark the permalink.